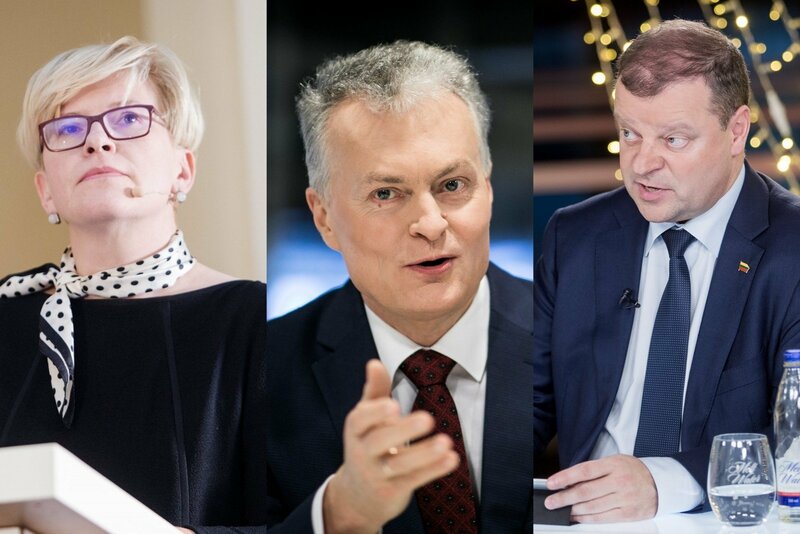 In slides prepared for the Lithuanian Economic Conference presenting the Vilmorus survey, we can see that if I. Šimonytė and S. Skvernelis met in the second round, I. Šimonytė would win with 39.4% of the vote. S. Skvernelis would receive 28.2% of the vote. The remaining 32.3% would not vote for either or would not attend the elections. If the second round featured G. Nausėda against I. Šimonytė, the former would receive 35.6% of the vote, while the latter – 28.4%. 35.9% of voters would either not attend or would vote for neither respondent. "I believe that the most interesting scenario would be [the face-off of] G. Nausėda and I. Šimonytė. The difference [in their ratings] is very small, with G. Nausėda's ratings at 23.5% and I. Šimonytė's at 22%. If the second round is imitated, the difference increases. Most likely this is because G. Nausėda always had a broader electorate," Vilmorus head, sociologist Vladas Gaidys said. When reviewing voters' views on the future president's cooperation with the Seimas majority, very similarly sized groups believe that either the president should cooperate more with the Seimas majority (39.8%) and that the president should dedicate more attention to the control of the Seimas majority's activities (38.9%). 21% of respondents do not have an opinion on this matter, while 0.3% would choose a different answer. S. Skvernelis' supporters are most interested in the president cooperating with the Seimas majority. 54.3% of them supported cooperation, while 30.4% of them were in favour of greater control of the Seimas majority. The supporters of the other candidates were more of the belief that the Seimas majority requires more oversight. This was the opinion of 44.7% of G. Nausėda's and 46.4% of I. Šimonytė's voters. Respectively 33.6% and 35.9% thought that more cooperation is needed. Among areas where the president elect is to focus most on, 34.3% of respondents noted economic development – "seeking to ensure more rapid development of the Lithuanian economy." 27.6% of respondents thought that the president elect should dedicate most attention to foreign policy, seeking the most favourable environment for Lithuanian business development. 26.1% thought that the president elect should focus on transparency, seeking for the legal system, politics and news media to rid themselves of corruption. 11.9% of respondents stated that they are unsure, what the president elect should focus on. That the economy is the key priority was particularly the expectation of G. Nausėda and S. Skvernelis' voters, respectively 40.4% and 32.6%. Among I. Šimonytė's voters, this sentiment was found among 29.1% of respondents. A comparably large portion of I. Šimonytė's voters believe that foreign policy is most important. This was the belief of 34.5% of her supporters, while among G. Nausėda and S. Skvernelis' voters this was the belief among respectively 24.3% and 29.9% of respondents. Transparency was a priority for 25.5% of G. Nausėda's, 26.8% of I. Šimonytė's and 26.8% of S. Skvernelis' voters. When evaluating the overall status of state welfare, 30.2% of respondents thought that the Lithuanian state, its economy, transparency of legal systems and democratic systems are in a decline, while a comparable number (29.5%) thought that these elements have been growing stronger or have remained unchanged (29.9%). 10.3% did not know what to answer. When separated by candidates, a very comparable number thinks that democracy is growing stronger (31.9%) and growing weaker (32.3%). Meanwhile, 26.4% of them believe that the situation is not changing. Most (40.5%) of I. Šimonytė's voters believe that democracy is growing stronger, 23.6% believe that it is weakening, while 26.8% think the situation is unchanged. 32.6% of S. Skvernelis' supporters thought that democracy is growing stronger, 28.8% thought that it is weakening and 31% thought that the situation remains unchanged. Vilmorus sociologists also surveyed, how the candidate's voters would be distributed among one another. For example, it would appear that votes for G. Nausėda would mostly go to I. Šimonytė. If G. Nausėda would be out of the race, 44.3% stated they would back I. Šimonytė, while 11.9% would back S. Skvernelis, 16.5% - would choose a difference candidate, 21.3% do not know how they would vote and 6% would not vote. If I. Šimonytė was to drop out of the race, 55% of her voters would back G. Nausėda, 9.1% - S. Skvernelis, 17.7% - a different candidate, 16.4% are unsure and 1.8% would not vote. S. Skvernelis' voters would typically (34.8%) be inclined to back a different candidate if S. Skvernelis dropped out of the race. 18.5% would back G. Nausėda, 10.3% - I. Šimonytė, 31% are unsure and 5.4% would not vote. The number of those prepared to vote in the presidential elections rose in March, up to 53.7% from 47.5%. The number of those likely to attend was respectively 34.5% and 29.7%. In February, 4.9% of respondents stated they would likely not vote in the elections, compared to 4.6% in March. In February, 4.1% would definitely not have participated, compared to 3.8% in March. In February, 9.1% of respondents were undecided, compared to 8.2% in March. When considering the voters, who answered in February they will definitely participate in the elections, it is notable that 37% of those aged 18-29 thought so, 57% aged seventy and over and 49% of Lithuanians and 31% of Lithuanian Russians. 47% of voters without high school education were definitely prepared to vote compared to 60% of those with higher education. 22% of unemployed respondents were certain they will attend the elections, 25% of those with incomes up to 200 euro per family member and 62% of those, whose incomes are 601 euro or more. 57% of respondents in Vilnius were definitely planning to attend, 54% in the major cities on average, 39% in the regional centres and 44% in rural areas. Based on the survey, 70% of Homeland Union – Lithuanian Christian Democrats (TS-LKD) supporters were intent on participating in the elections, 59% of Lithuanian Farmer and Greens Union voters and 49% of Lithuanian Social Democratic Party voters as well. However, the parties' supporters do not necessarily back their party's candidate. Looking at the numbers, which candidate's voters are confident they will attend the elections, so far I. Šimonytė has most cause to celebrate. Based on February survey data, 70% of her voters were definitely intent on going to vote. The same intentions were expressed by 55% of both G. Nausėda and S. Skvernelis' voters. When looking at the candidates' supporters based on social demographic traits, it can be seen that I. Šimonytė is a favourite in the youth group (18-29 years old), with support of 32.3% in it. G. Nausėda have the backing of respectively 17.3% and 11.3% of the group. The favourite of middle aged (40-49) voters is G. Nausėda, with support of 26.4%, while I. Šimonytė and S. Skvernelis are backed by respectively 19 and 18.2% of respondents in the group. S. Skvernelis is most popular among retirees, with 24.1% support in this group. G. Nausėda trails close behind at 23.6%, while I. Šimonytė is third with 20.8%. I. Šimonytė is also most popular among students, with 34.5% support in the group. G. Nausėda and S. Skvernelis respectively hold 20.7% and 17.2% support here. She is also most supported by individuals with higher education. In this category, I. Šimonytė has 31.6% support versus G. Nausėda's 26,4% and S. Skvernelis' 11.9%. Among those employed with a higher education, most (29.7%) would support G. Nausėda, with I. Šimonytė having the support of 28.5% and S. Skvernelis – 12%. G. Nausėda is most popular among workers, with 19.7% respondents' support, 16.2% would vote for I. Šimonytė and 16,8% for S. Skvernelis. Among those with incomes of 601 euro and higher, support is highest for I. Šimonytė, who has the backing of 32% respondents in this group, while G. Nausėda has the backing of 26.8% and S. Skvernelis – 12.4%. The March Vilmorus survey also looked into which parties' electorates back which candidates. Also, how they fare in the cities, regional centres and rural areas. Most of the TS-LKD electorate (68.7%) would back the party's candidate I. Šimonytė, however a significant portion (21.1%) favour G. Nausėda, while only 1.2% support S. Skvernelis. The "Farmer" electorate was also mostly (60.8%) inclined toward the party's candidate S. Skvernelis, while 15.9% would vote for G. Nausėda and 9% for I. Šimonytė. 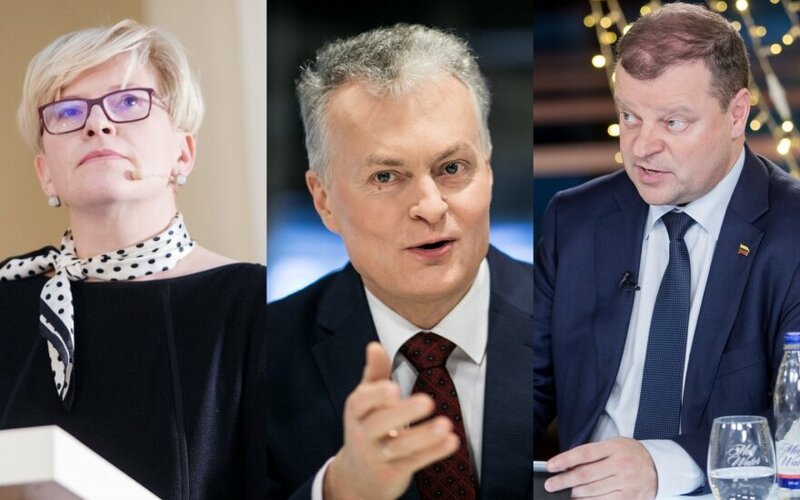 The largest group of the Lithuanian Social Democratic Party's voters (22.4%) would back G. Nausėda, 16.5% would back S. Skvernelis and 11.8% - I. Šimonytė. G. Nausėda also has the favour of the largest part of Order and Justice party voters – 36.7%. In this group, 20.4% would give their vote to I. Šimonytė and 4.1% to S. Skvernelis. Most Labour Party voters would back S. Skvernelis (28.3%). Meanwhile, G. Nausėda and I. Šimonytė have support from respectively 20.8% and 18.9% of this group. G. Nausėda is also most popular (30.7%) among those, who have no preferred party. I. Šimonytė and S. Skvernelis have respectively 16% and 6.1% support in this group. Looking geographically, I. Šimonytė is most popular in Vilnius where she would receive the votes of 36.4% of respondents, while G. Nausėda and S. Skvernelis respectively – 23.1% and 11.8% of respondents. In other cities, G. Nausėda leads with 27.3% of respondents versus I. Šimonytė's and S. Skvernelis' respectively 17.7% and 13%. Furthermore, G. Nausėda is popular in the regional centres, where he has the backing of 23.2% of respondents versus I. Šimonytė's 18% and S. Skvernelis' 18.8%. In rural areas, S. Skvernelis is most popular with 25.8% of respondents' backing versus G. Nausėda and I. Šimonytė's respectively 21.2% and 19.3%.